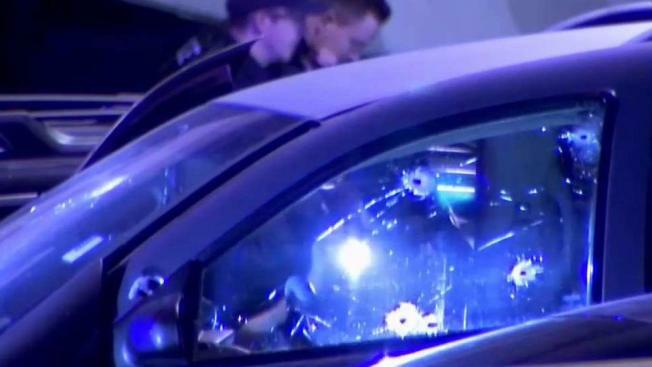 Police on Monday evening were investigating a double shooting at a Target store parking lot in Emeryville that left two people critically injured. Two people were taken to a hospital after being hit by gunfire, and one person was detained, according to the Oakland Police Department. The store is located at 1555 40th St., police said. One of the victims was found at the scene, near a Dodge Durango, which was riddled with bullet holes in the driver side door and window. Police said the second victim walked or ran a couple hundred yards to a Home Depot store, where someone called for help. Witnesses reported seeing a man next to the SUV firing a gun and one man being hit by gunfire. Other witnesses said they hear about 10 gunshots. "All of a sudden you hear pop pop pop pop and then another pop pop, another round," witness Michelle Hilario of San Francisco said. Dozens of officers then swarmed the scene. Three guns were recovered at the scene, police said. Police reportedly closed the store and were clearing customers from the area for the investigation.